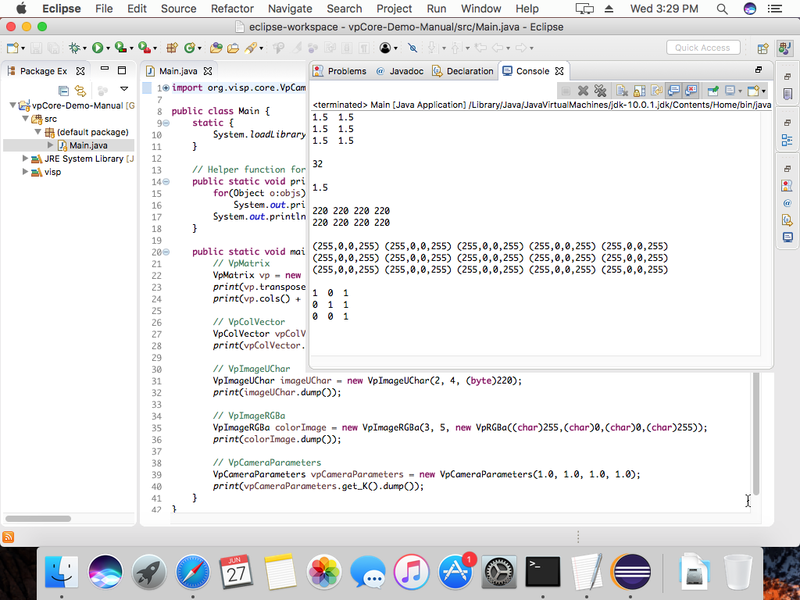 Equivalent to the opencv_java module - providing basic conversion functions and the JNI support too. Made a few edits. Will soon run the tests and provide results. Need to define some java files as of OpenCV for the java module. But their directory structure is different from that of ViSP. Should separate the files in core/src and core/test? Do vpMatrix, vpRect, vpPoint support any data type other than double? And vpPoint is a 3D point. Coz then there will be fewer functions for usage and testing in java - can develop it faster. Should I keep class name qualifiers as CamelCase - VpMatrix/VpException instead of vpMatrix/vpException in java? For me vpMatrix, vpRect, vpPoint should support only double as it is by now. Concerning the class name, could you give us more details. I don't see why this is needed and didn't find similar things in OpenCV. You can refer here, C++ classes in OpenCV are named CamelCase way by default(like Mat and Rect). So there's no need to change class name in Java. But ViSP C++ classes like vpImage, vpRGBa are not CamelCase. Recently I made some edits in visp_java module. The build ran successfully on my device but fails on Travis (Refer here). Am I missing some code or header file? Does Travis CI has necessary JNI library? Do you have Travis configured to provide NDK support? I can't find sign of either JNI or NDK in this PR or in #307. You can refer this thread that the SDK that Travis provides by default is old/buggy. To get the support, refer this. Also get the visp_gui module demo eclipse project here. As @s-trinh recommended, I've used Java Swing for GUI - it's simple, platform independent and many developers will find it easy to use it. Note that I haven't wrapped visp_gui for Java support. I think Android developers won't need visp_gui or visp_io modules at all (in fact the getPixels function in VpImageUChar and VpImageRGBa classes will suffice in Android). I guess we should add these set of Java tutorials to the doc/tutorial/java folder. Strange. Can you see libvisp_java320.so in .../visp-build/lib folder? I think you can add frame.setDefaultCloseOperation(JFrame.EXIT_ON_CLOSE); in VpDisplay to really close the window otherwise the application looks still running in Eclipse. and public static void print(Object ... objs) in the demo project could be removed also? It was nice to see that all your 3 demos were working on OSX and Ubuntu 16.04. I don't know if this is ok for you or if you have an other planned schedule ? If you want, there is also the possibility to have a skype to discuss about that. First of all, thanks. It would've taken me a lot of time to draft such a concrete plan. I'm all good with this plan(actually I was going to discuss closing of PR #323 with you in a few days). I understand that by making smaller PR's, the code will be easy to review later and changes easy to track. Just want to make sure - are all the things(mentioned above) to be done before 9th July. Coz then I'll have to speed up a bit. We should close the PR now. I've executed the tutorials on Windows, with MinGW and it worked well. @fspindle ant is installed on appveyor but not detected during java build - its working well on mac. Shall I push the GUI changes in this PR or make another PR?